You are currently browsing the category archive for the ‘Media’ category. Emily Yeh has lived in Newport for 18 months, arriving to seek sanctuary from Taiwan. 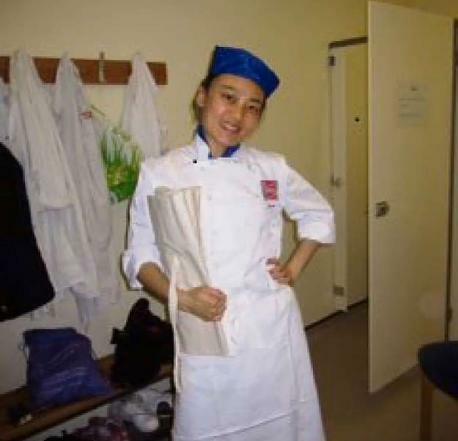 She refused to be an intelligence officer for the Taiwanese government as she became morally uncomfortable with the work she was asked to carry out. She was detained on Tuesday 10th December, “Human Rights Day”, and held at Newport Central Police Station. As soon as news came out that she was to be forcibly removed from the police station to a detention centre, some 25 friends turned up to show solidarity and kept a presence there for over 12 hours. She is now in imprisoned in Yarl’s Wood, a detention centre run by Serco, on behalf of the UK Home Office, who intend to forcibly remove her from the UK. Since then, her friends and other activists have set up a campaign (originally referring to her as M.Y. to protect her identity) calling for her to be returned to Newport – where she can continue to build a new life for herself within the community where she has become such an important and valued member. In Taiwan she would face a very uncertain future. There is a website and a Facebook page with daily updated information. Her case has gone global, with reports in the media in Taiwan, China, Pakistan and Qatar, among others. Hundreds of emails and phone calls later – most during a phone blockade of EVA Airways, who were due to fly her out of the UK – Emily is still in the UK, but has been taken ill; with bad stomach pains, blood in her urine, and a diagnosis of kidney stones, and possible epilepsy. Emily is incredibly grateful for the overwhelming support she has received, and, as she attempts to recover from her illnesses, almost definitely made worse by the stress of her situation, she is in talks with her solicitor, who is also fighting for her to stay in the UK, as is her right under the Geneva Convention and the Universal Declaration of Human Rights. Her friends have reported that Emily claims that staff at Yarl’s Wood had “pushed (her) off her seat” and that there were “bad things said to her/about her”. If confirmed, this would be a serious allegation against the staff there, especially after when much controversy has already surrounded Yarl’s Wood, after hunger strikes, fires and the recent sexual abuse some of the woman detainees have suffered at the hands of its staff. The campaign still hopes and plans to continue trying to persuade the airline not to take Emily, and for the Home Office to release her so that she can be returned to Newport where she belongs. Here’s the slightly delayed latest issue of Movement, events over the last few weeks have meant this issue has changed a few times before publication. As is often a problem with print media our two cover stories may develop considerably within hours of publication. You can keep up to date with these stories and more on the Movement website, which hosts extensive links from across the movement for freedom of movement and equality for all (and beyond). share this link online, forward it to anyone who might be interested, or better still, publish your own article promoting the newsletter. Here’s the first issue of 2010, as usual packed with the latest news and opinion from the movement for free migration. The second issue of the No Borders newsletter has hit the streets, and is packed with all the latest happenings in the struggle for freedom of movement and equality for all. plus upcoming events, contacts, links and more. The No Borders UK Newsletter has been rotated around local No Borders groups for the last few years. Last month’s network gathering in London, signalled that it is now our turn to produce the publication. We intend to create a more regular and broad based periodical, drawing in others that work to end the inhuman cycle of detention, deportation and death through the abolition of migration control. As a statement of intent we are re-naming and re-launching! and a round up of cross border news. Newsletter gets in a Newspaper! 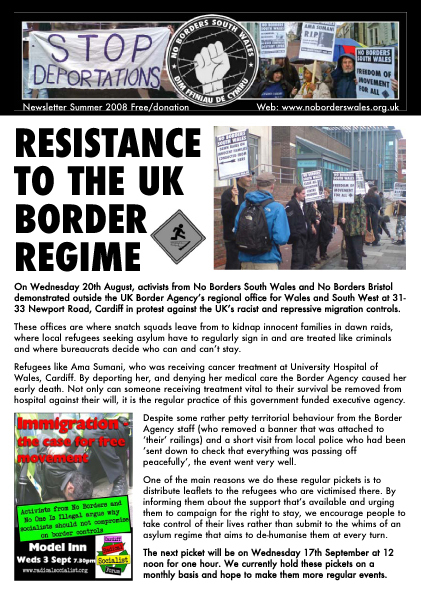 The recently produced first issue of the No Borders South Wales Newsletter, made the news in it’s own right yesterday when Media Wales published an article under the headline: ‘Asylum campaigners launch newsletter‘ then followed it up with a a link to this very website! Three cheers for David James of South Wales Echo, a fantastic bit of free publicity! ASYLUM campaigners who opposed the deportation of late Ghanaian cancer sufferer Ama Sumani and are fighting on behalf of several other asylum seekers, have produced their first newsletter. The group, called No Borders South Wales, kicked off their first two-page newsletter with a report about a protest outside the Border and Immigration Agency regional headquarters on Newport Road, Cardiff, last Wednesday. The group plans to hold monthly similar pickets as it fights the deportation of other South Wales-resident asylum seekers including pregnant Nigerian Kemi Ayinde who, as a teenager, was trafficked into the UK to work as a child prostitute. You can download a .pdf of the newsletter. In order to further spread information about our activities and upcoming events we’ve produced our first newsletter. In the past we’ve contributed articles to the South Wales Anarchists newsletter Gagged!, (here’s all our stories) but as an issue hasn’t appeared in a little while, we decided to produce our own. It’s only a double sided A4 sheet but we’ve managed to cram in articles about the last picket of the UK Border Agency offices, Constance, BB, Jean Pierre, Kemi, ID Cards, and our collective statement along with adverts for the Cardiff Radical Socialist Forum, the Bristol anarchist bookfair, the Freedom of Movement block against the Labour party conference and No Border Fest. You can LISTEN HERE to an interview with a No Borders South Wales activist on Radio Cardiff, on 24th April, after a blockade of the Border & immigration agency.